What are some common causes of dogs hiding? Is your dog hiding? Here’s why — and how to help her. Photography ©hidako | Thinkstock. If your dog often disappears, you might wonder if this behavior is normal. The most important thing to look for when assessing dog hiding is change. Many times, a dog hiding is responding to some kind of change: perhaps a move, a loss, the introduction of new people, a new place, etc. “Hosting out-of-town guests, traveling or even just a change in [a dog’s] daily routine can be stressful for dogs and can sometimes cause them to seek hiding spots,” Dr. Dilmore says. Or, could it be a change in the weather, environment or in the people surrounding your dog? “This behavior can also be seen during anxiety-inducing situations like thunderstorms or when fireworks are going off,” Dr. Dilmore adds. Does dog hiding ever signal health issues? Most often, a dog hiding is responding to some kind of change in her regular routine. However, if you are having a hard time pinpointing a significant change, consider your dog’s health. In some cases, dog hiding indicates a health issue. 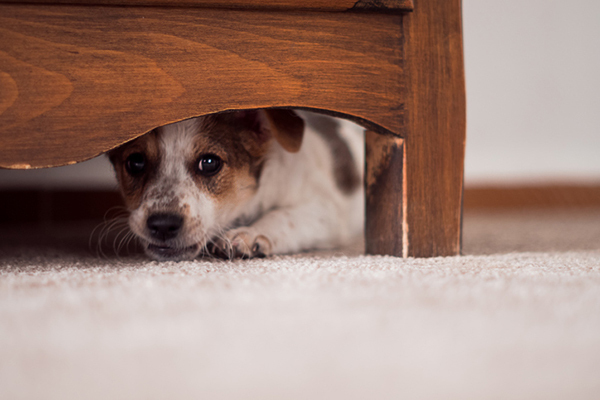 How can you stop dog hiding behaviors? Stay on a schedule: Keep your daily routine as consistent as possible. That means feeding, walking and playing with your dog at the times she’s used to. Offer a comfort zone: Provide a safe place for your dog to escape to. A quiet bedroom where your dog can go to get away from the commotion and be alone may help to alleviate anxiety. Meet and greet with caution: Don’t force your dog to interact with new people or unfamiliar pets. Allow your dog to initiate the contact. Is dog hiding ever a cause for concern? As mentioned, dog hiding is usually indicative of stress on your dog, but in some cases, it signals a health issue. How can you tell the difference? Knowing your dog’s normal behaviors and tracking any important changes in her routine is crucial to assessing your dog’s reasons for hiding.